An annual MOT check is a legal requirement to ensure that your car is roadworthy, the test reveals potential problems that could affect the safety of your car further down the line. Warrantywise have put together a blog post that explains everything you need to know about the MOT test. MOT is actually named after a defunct government department named the ‘Ministry of Transport’, which was renamed to the Department for Transport in 2002. The MOT test was first introduced in 1960 by Ernest Marples under the Ministry of Transport and was mandatory for any car over ten years old. The test was only carried out on the brakes, lights, and steering and was carried out every 12 months after that. The first commercial vehicle exam was introduced in 1962, each passing vehicle was issued with a certificate. This certificate was required to tax the vehicle. More items have been added to the test over the years as cars have evolved. What is checked on an MOT? 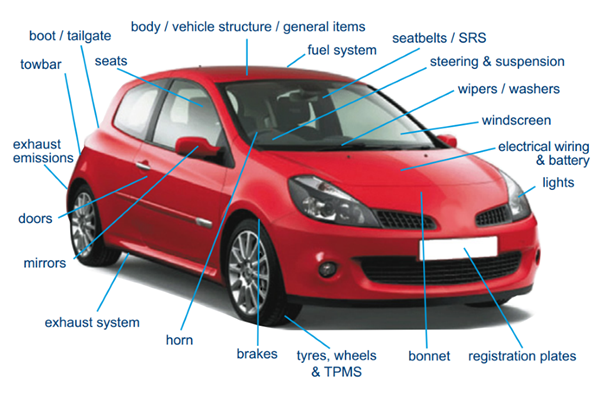 Nearly every aspect of your vehicle is checked under the MOT test. Make sure you are not caught out by not having any liquid for your windscreen washers. Doors – All doors must open and close correctly and ensure the latch is secure when the doors are closed. The front doors should be able to be opened from both the inside and outside of the car. When Does a New Car Have its First MOT? After purchasing a brand new car, you won’t need to take a MOT test for the first 3 years. After that period you will need to take the MOT test every 12 months. According to gov.uk 3 main faults can be avoided by performing a few simple tasks. Warrantywise offer MOT Failure as part of your Car Warranty, which is designed to provide the repair cost of included parts which have failed the DVSA annual MOT test, together with the cost of any re-test free. For more information on a Used Car Warranty contact us today.